There are 474 items in iPhoto’s trash. I’ve been trying to empty that trash and it just won’t. Do you have any suggestions for me in completing this task? By way of background for others, let me explain that iPhoto has a trash separate from the Finder’s trash. When you delete images in iPhoto, they go into this separate trash and they’re not deleted from your Mac until you expressly tell iPhoto to empty the trash. You do this by Control (right) clicking on iPhoto’s Trash icon and choosing Empty Trash from the contextual menu. If you’ve tried that with no satisfactory results it’s possible that you’ve hit a fairly common snag where iPhoto has difficulties deleting a lot of images in one go. The solution is to select all the images in the trash, assign an identifying keyword to them (I’d suggest “trash”), and then choose Photos -> Restore to iPhoto Library. 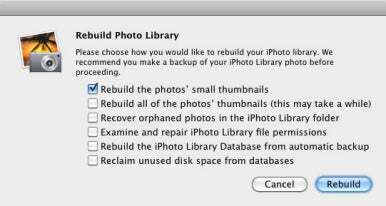 This, as you might imagine, places the trashed photos back in your iPhoto library. Now choose File -> New Smart Album, create an album with a condition that reads: Keyword is Trash, and click the OK button that creates the smart album. Select a hundred-or-so images in that smart album and press Command-Option-Delete. This tosses those images in the trash. Now use the Control (right) click trick to empty the trash. If successful, do the same thing with another hundred images. Keep going until the images are really gone. If none of this works, iPhoto may have a touch of the corruption. Quit it, hold down Command and Option, and launch it. A Rebuild Photo Library window will appear. In this window you’ll see a number of repair options. Start with the first one (Rebuild the Photos’ Small Thumbnails) and give it a try. Check iPhoto after you’ve done this to see how it behaves. If it’s still funky, give the next option in the Rebuild window a try. Rinse and repeat until iPhoto bends to your will.